Director: Richard Friedman / Writers: Robert King, Tony Michelman, Scott J. Schneid & Frederick R. Ulrich / Cast: Derek Rydall, Kari Whitman, Rob Estes, Morgan Fairchild, Jonathan Goldsmith, Pauly Shore, Kimber Sissons, Tom Fridley, Gregory Scott Cummins, Ken Foree. In Clueless, Alicia Silverstone says: “Searching for a boy in high school is as useless as searching for meaning in a Pauly Shore movie.” Had she tried Phantom of the Mall? I have an inexplicable fascination with Californian mall movies of the late 80s-early 90s so was stoked to learn of this slasher film from the same time and place. With Pauly Shore. And Morgan Fairchild. And Ken Foree! And – if you look hard enough – Kelly Rutherford. While working on a budget somewhat lower than its non-bloodythirsty brethren, this, like, totally bitchin’ riff on The Phantom of the Opera is at least distracting enough with its differences to be entertaining once. While quite poorly produced, the mall setting makes things look a little more slick and the plot is fattened up with subplots about corrupt developers and hired hitmen with trippy earrings. 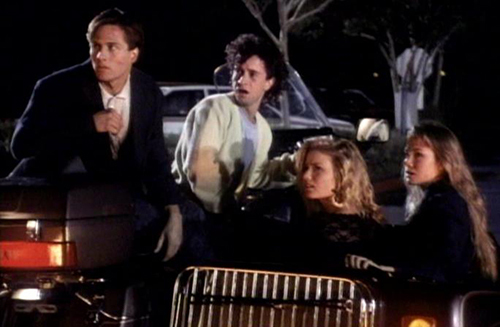 Meanwhile, a shady character is popping up to commit the odd murder: Security personnel who happen upon his lair, annoying teenagers played by Friday the 13th alumni, and those involved with the house fire and subsequent cover up. He’s also keeping watch over Melody, leaving her favourite flowers in her locker, putting “their song” is the jukebox, buying her the dress she couldn’t afford, protecting her from car park thugs. Melody teams up with cutesy press photographer Peter (Estes) and they try to hunt down the sleazy hitman who started the fire, while he is also on to them – but Eric’s got other plans. 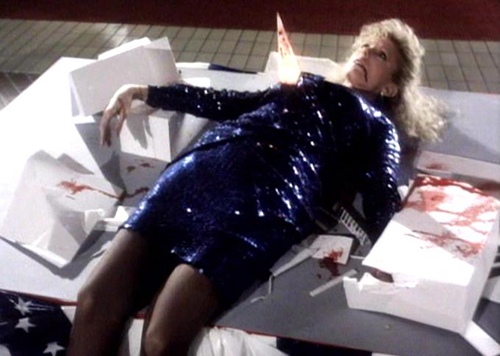 Phantom of the Mall is so intrinsically 80s it’s entrancing like a lava lamp; the hair and fashion choices, the suspicious zooms on questionable characters like an episode of Murder She Wrote - and Fairchild’s puffed-up do. There’s also a fair wad of above average stunt work, the kinda thing you’d see week to week on any A-Team-esque action show, likeable characters and an amusing gag about subliminal pro-spending messages being pumped into the mall beneath the muzak. 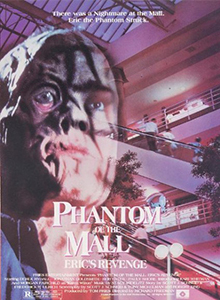 Watch the end credits for the godawful Is There a Phantom in the Mall? song. Sooooo 80s. As inoffensive as the fluffy ambience in which its set, it’s about as fun as hanging out at the mall. And no, Pauly doesn’t die. Blurbs-of-interest: Rydall was in Popcorn; Tom Fridley was Cort in Friday the 13th Part VI; Gregory Scott Cummins was in Hack-O-Lantern; Ken Foree was in Leatherface: Texas Chainsaw Massacre III and Rob Zombie’s Halloween; Kelly Rutherford was Cotton Weary’s girlfriend, Christine, in Scream 3; Richard Friedman previously directed Doom Asylum. Someone now needs to make a horror film about headphones or plugs that let you hear subliminal messages and frequencies. It would be like They Live!… but with ears.